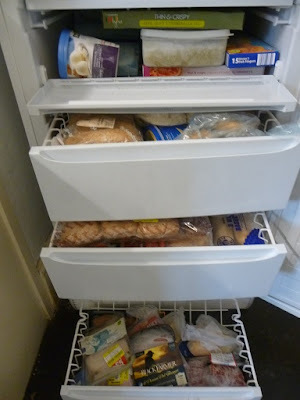 During June, I decided to cut our shopping bills by eating the contents of our cupboards, fridge and freezer. This store cupboard challenge provided an incentive to try and use assorted ingredients that had been sitting around for months, if not years. I finally faced up to strange ingredients bought for specific recipes and abandoned, like artichoke hearts and soba noodles. I experimented with the odds and ends left from an Approved Food order, such as unexpectedly large cous cous and Pizza Express Light Dressing. I tackled long forgotten leftovers, like the remains of a bag of frozen mixed berries and the last remnants of brown lentils. 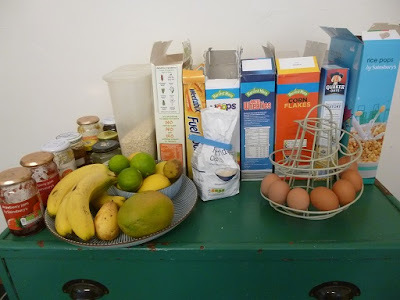 I even experimented with some budget ingredients bought with the best intentions and then ignored for lack of inspiration, from red lentils and pearl barley to tins of pilchards, pineapple and grapefruit. Although I did replace some stuff when it ran out, especially cereal, jam and ketchup to avoid family mutiny, with other ingredients I switched to using a different kind of oil, or another kind of pasta, rather than replacing the original version automatically. Main food cupboard a month later. Top of green cupboard afterwards: Fewer jars and eggs, less fruit, different cereal. Mantelpiece after tackling giant cous cous, raisins, sugar and noodles. 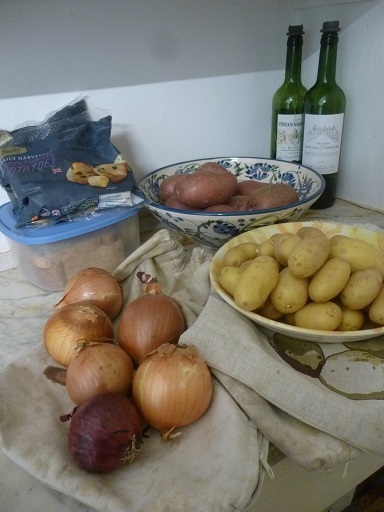 and we did make a dent in the 12.5kg sack of potatoes I forgot to photograph at the start. Before I started the store cupboard challenge, our foods bills were running at £67 a week for a family of four. During the challenge, I ended up spending just over £40 a week – down a hefty 40%. 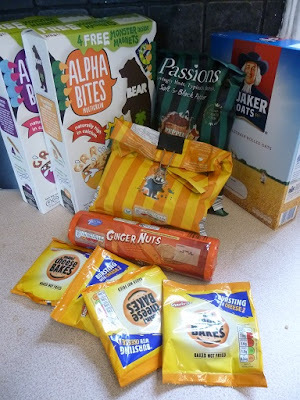 Having £39 in vouchers to use definitely helped, but I do normally try and take advantage of money-off voucher anyway, so my normal food spending would include a certain amount. As far as I’m concerned, that’s a pretty good result. I didn’t pare everything down to the bone but stuck to relatively normal meals for us, without stinting on fresh fruit and veg. However, I made more effort to plans meals and minimise food waste, which definitely helped cut costs. I also continued taking advantage of yellow-stickered bargains, so long as they would actually get eaten rather than clogging up the freezer. 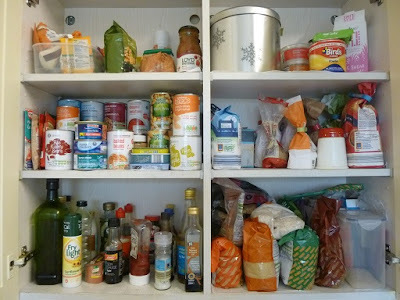 I did restock some store cupboard items during the challenge, like cereal, jam, coffee, ketchup, pesto, sugar, syrup, stork and flour, but there are still a bunch of staples I’m looking forward to replacing, like olive oil, balsamic vinegar, stock cubes and soy sauce. No doubt my food bills will go up again this month, but I’ll continue to monitor our food spending. It was an interesting exercise, and there are still shelves I intend to tackle. I didn’t make any of my own bread for example, so the part-used bags of flour remain. The best part is that I no longer feel guilty staring at abandoned ingredients, and now have space to stock up on stuff we actually eat regularly. 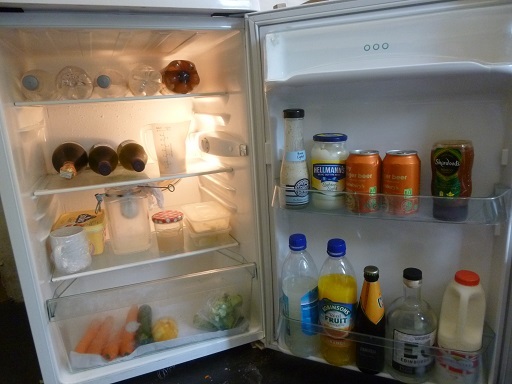 Can you see any advantage of a store cupboard challenge, eating the contents of your cupboards, fridge and freezer? 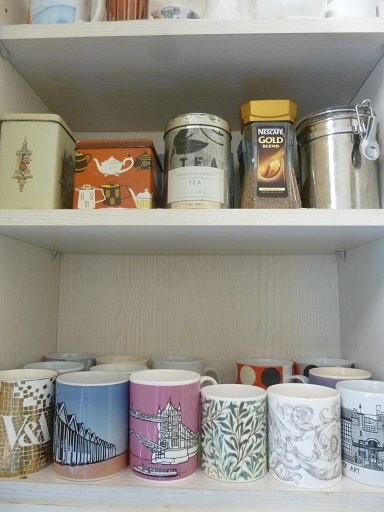 ……….and when she went there the cupboard was bare! Yes, it's been a funny feeling seeing space in the cupboards and fridge! Oh yes, there is definitely an advantage of doing this sort of challenge at least once every year. It uses things up before they get out of date and perhaps need throwing away, it refreshes your mind as to what you have lurking at the back and it means you step out of the same old, same old meals week after week and means you get to experiment a bit more. It also shows you what meals you actually like to eat regularly as a family and puts a brake on buying ingredients that just don;t get used up after an initial experiment. You did really well ….. and it was really interesting watching your progress. I've enjoyed the whole series of these posts and you put me to shame. We have no children at home but I still sometimes shop as if there were 4 of us. My cupboards are full of tins and ingredients and I spend a fortune. I am going to take a leaf out of your book and cut right back for a few weeks. Thank you! Good luck with your own version of a store cupboard challenge. I had many things I'd been meaning to get round to using, and would still be cluttering up my cupboards without this incentive. Hope you get to put any money saved to good use! You've inspired me to do the same. I need new runningshoes and money is a bit tight at the moment. 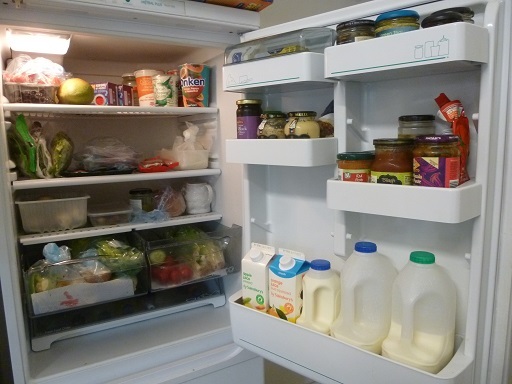 My cupboards, garden, fridge and freezer are filled with a lot of food. I've started yesterday and hope to do very well! Most exciting having a garden to rely on too, hope you do manage well enough to get your running shoes. Maybe my next challenge should be to plant some of my neglected seeds, would be wonderful to have some home produce. So far I've only been able to use a bit of mint and parsley from the fledgling herb garden. I always find it really satisfying to try and eat our way through store cupboard items, especially ones that have been kicking around for ages. I've done it recently and started being very careful what I reintroduce. 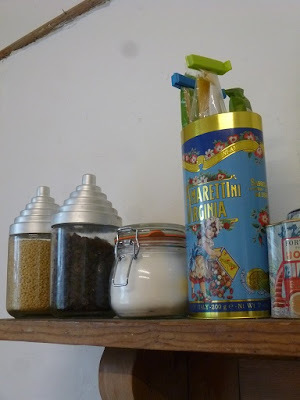 It surprising how few things you actually use regularly when you pare it right down and I'm trying to stick to a pared down food cupboard on a regular basis now as it just makes life more simple and straightforward. With regard to the fridge, I know it sounds sad, but I love to see our fridge virtually empty at the end of the week, as it means that everything I'm buying or growing is getting used up and I'm not wasting anything. Congrats on using up so much before your house move – I seemed to bring most of our stuff with us! Amazing how food cupboards fill up again. I'm glad I managed to shift some of the really old and odd things, but there's still food I need to get round to using.